Home to the last gold rush in America, Teller County attracted a slew of peculiar characters. And many never left. A Victor Hotel regular named Eddie met his untimely death when he tumbled down the elevator shaft. A female apparition clad in Victorian clothing appears on the stairs of the Palace Hotel. A closed tunnel on Gold Camp Road is said to echo with the sounds of screaming children. And lingering spirits are still prisoners at the old Teller County Jail. 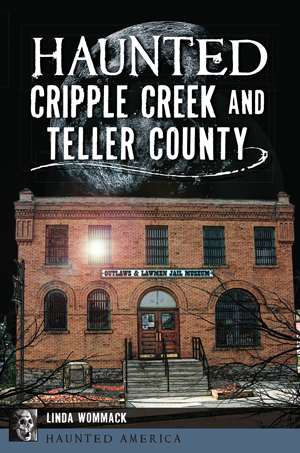 Linda Wommack uncovers the eerie thrills and chills of Cripple Creek and Teller County. Linda Wommack is a Colorado historian and historical consultant. She has written eight books on Colorado history and has contributed to two anthologies on Western Americana. Linda has been a contributing editor for True West magazine since 1995 and a staff writer contributing a monthly article for Wild West magazine since 2004. She has also written for several publications throughout her state including the Tombstone Epitaph, the nation's oldest continuously published newspaper.